Seminole State College inaugurated Dr. Georgia L. Lorenz as its third president during a ceremony held at the Sanford/Lake Mary campus March 22. To begin the ceremony, Seminole State College faculty and staff processed south of the UP building and Student Center into the parking area set up for the inauguration. 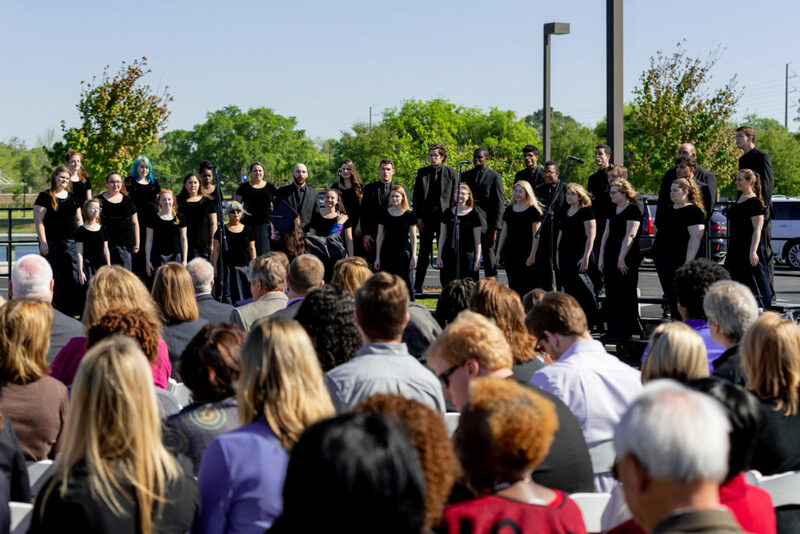 The ceremony included musical accompaniment by the Center for Fine and Performing Arts. The event was called to order by Scott Howatt, chairman of the college’s District Board of Trustees. Howatt then welcomed the estimated 300 in attendance. “During her first months on campus, Dr. Lorenz has hit the ground running,” Howatt said. He said Lorenz had listened to and learned from each person she has met. Howatt then welcomed the estimated 300 in attendance. A succession of speakers offered greetings to Lorenz and the audience, including Deborah Mead, vice-chair of the Faculty Senate; Shayan Khan, president of the Student Government Association for the Sanford/Lake Mary Campus; Jeffery Shimizu, former vice president of Academic Affairs at Santa Monica College, where Lorenz previously served in the same position; and Larry Campbell, former president of the Seminole State Alumni Association. During the installation, Lorenz received the college’s mace and chain of office. She then gave the inaugural address on the sunny and windy morning. “As I embark on my tenure as the third president of Seminole State College, I am deeply touched,” Lorenz said. “I have been afforded the chance to be part of a legacy. A legacy that began 53 years ago in a former citrus grove in Central Florida. Lorenz succeeds Dr. E. Ann McGee, president of 22 years, who attended the inauguration. The college’s first president was Dr. Earl S. Weldon, whose widow, Gerry Weldon, was present for the March 22 event. Lorenz said she hopes to build on McGee’s groundwork. 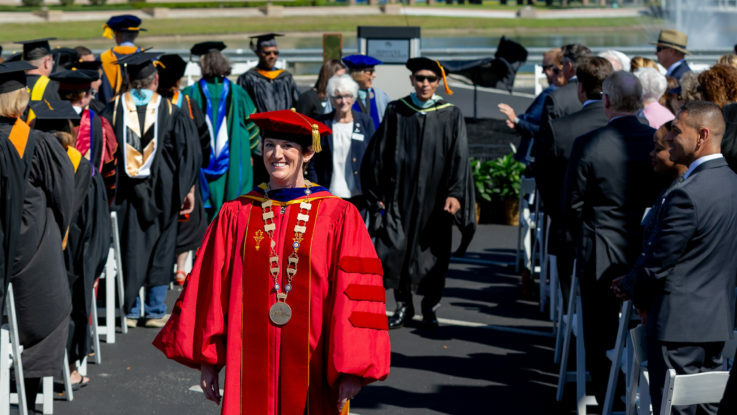 Under McGee’s leadership, Seminole State College expanded to four campuses and increased the amount of degrees and programs to more than 200, including seven bachelor’s degrees. 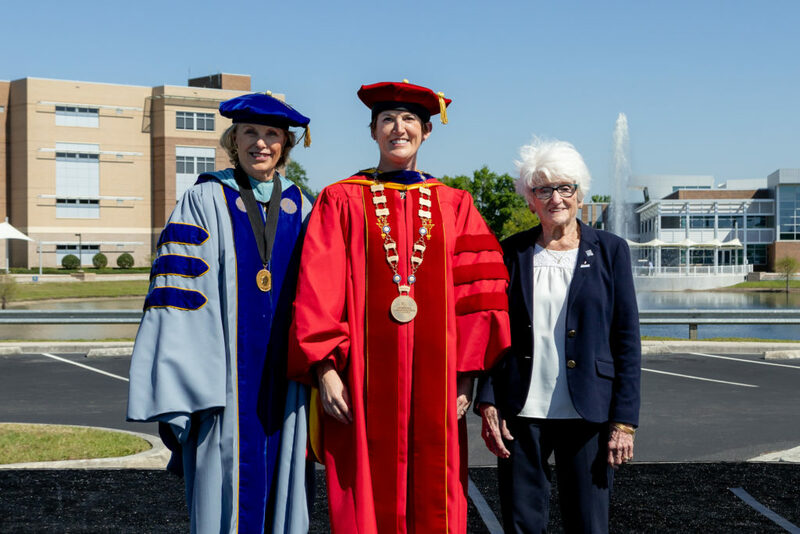 McGee will be staying with the college in the capacity of president emeritus, where she is “of counsel” to the new president and provides fundraising assistance to the college, according the SSC website. To celebrate the transition of power, the college coordinated several activities and events at each of its campuses. Among these is the “stockpile” of the Raiders Helping Raiders Pantry. The pantry, in partnership with Florida United Way and Second Harvest Food Bank, supplies students in need with food and hygiene products. Students can request assistance through the academic advising and counseling department. In her March 26 President’s Update email to the SSC community, Lorenz thanked the Inauguration Committee all the individuals and departments that had a hand in putting the inauguration together. She also thanked those who attended the inauguration. “Your presence at the ceremony and your support means the world to me,” Lorenz wrote. “I feel so honored by the hard work and care that went into the ceremony, and I am humbled by being honored in such an incredible way.